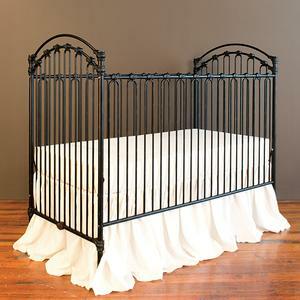 Iron baby cribs are, and always have been, a very popular option for new parents when designing their baby’s nursery. And, it’s for good reason. The durability of iron cannot be beat. It doesn’t crack, splinter, swell, or loose its shape over time, like wood cribs can. Also, it tends to be less bite friendly, so babies generally don’t teethe on them. 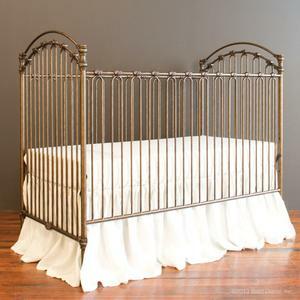 With a wrought or cast iron baby crib, you can get heirloom quality combined with a timeless appeal. So, it is easy to get that vintage look, which is so popular, in a brand new piece, that meets or exceeds current safety standards. 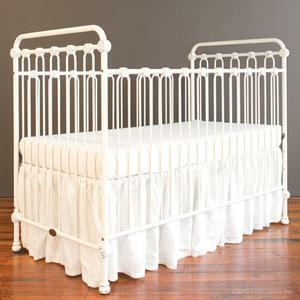 While it may be tempting to use an antique crib because the look is so gorgeous, never, ever do that. 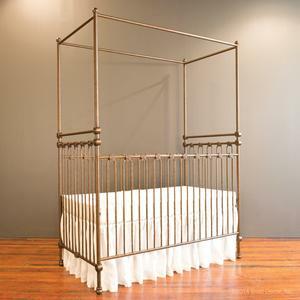 Antique cribs do not meet any of the latest safety standards as outlined by the United States Safety Commission and could be lethal to your baby. 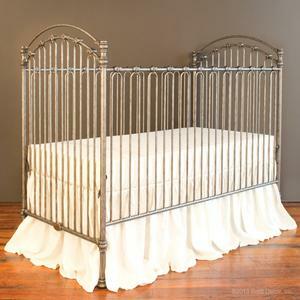 So many new parents assume that iron cribs are either unsafe of not as safe as wooden cribs. 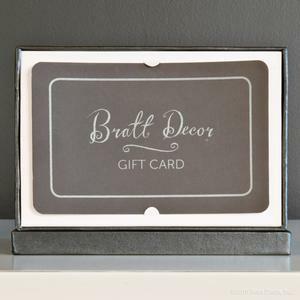 As makers of the most gorgeous iron baby cribs in the world, Bratt Decor gets this question all the time. If you are buying a brand new crib, by law, all cribs must adhere to the most current safety standards as set forth by the U. S. Consumer Safety Commission. 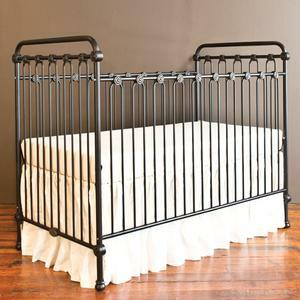 There is absolutely no difference as far as safety is concerned, between a brand new wood crib or a brand new iron crib. 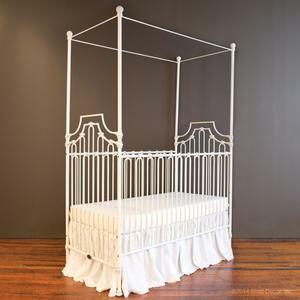 Older model and used cribs, regardless of their construction materials, may no longer meet safety standards, and may have been compromised in their integrity with usage and storage. We always recommend, if nowhere else, buy new when it comes to your crib. After all, this is the place where your baby will spend the most amount of time without your eyes on them. People fear that because metal is a harder substance than wood, that their child may be at greater risk for injury. But, this simply has no merit. Under normal usage of a brand new crib, weather it is manufactured with metal or wood, there is difference in risk of injury. If a child hits his mouth hard on a wooden crib or a metal crib, he will, in all likelihood, experience the same busted lip. Furthermore, because metal is not bite friendly, kids can’t sink their teeth into it the way the can with wooden cribs, they tend not to chew on their crib, resulting in even less busted lips. 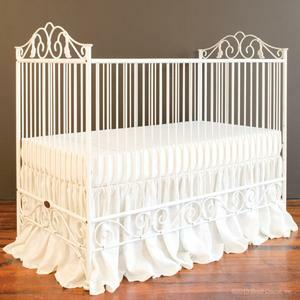 Also, iron cribs tend to have rounded edges rather than a straight edge which is often found on wooden cribs. 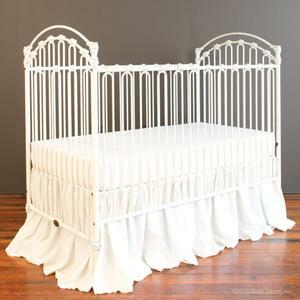 All of Bratt Decor’s cribs are designed and manufactured with the highest safety and quality considerations. So, when choosing between wood and iron, choose the for the look, the size, the price tag, all of which vary, but be assured, there is no unsafe choice. Every crib we designmeets or exceeds all current U. S. safety standards. 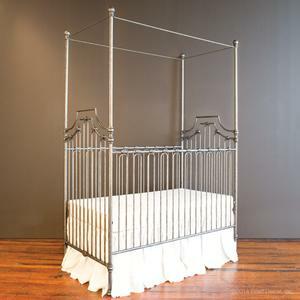 We’ve been making beautiful iron baby cribs since 1995, and have never had a recall. We pride ourselves on being proactive in safety design, going above and beyond what is required, to ensure that your child will sleep safely in their Bratt Decor crib. 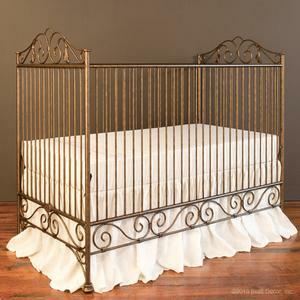 The beauty of an iron crib is undeniable. The design aesthetic you can achieve when you bend iron is unlike any other. The lyricism of bent wrought iron is fluid and airy, while the grandeur of cast wrought iron offers a style and solidity. 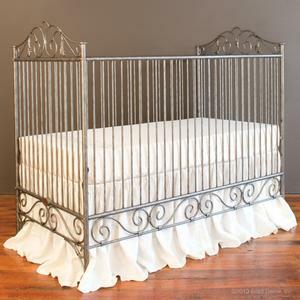 There is so much you can do, design wise with an iron crib, because it is so flexible in its ability to change its look. 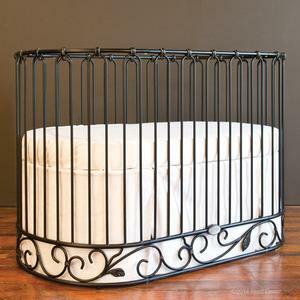 If you love a modern interior, opt for a black, oval baby crib, like our j’adore. The shape and color read modern with an unexpected beauty hidden with the lyrical lines throughout. 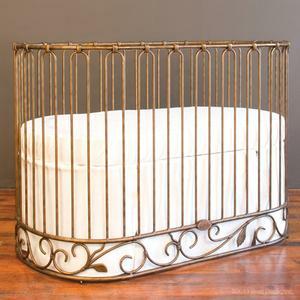 Or, try the gorgeous Joy iron baby crib, which boasts a very geometric design component in its circular castings. It’s simple, clean and perfect for either a modern or shabby chic environment. 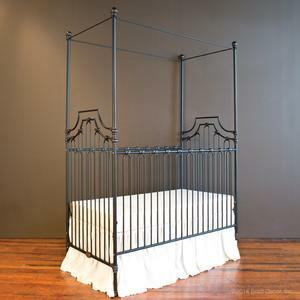 If you want the maximum in convertibility, look no further than the beautiful Parisian iron baby bed. 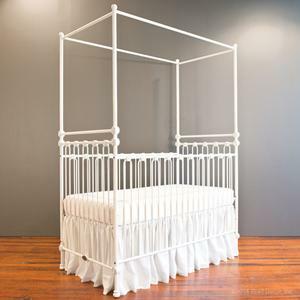 This gorgeous crib can be set up in 9 different configurations: as a standard baby crib, daybed, or toddler bed, as a canopy baby crib, as canopy daybed, or canopy toddler bed, as a four poster baby crib, as a four poster toddler bed, or as four poster daybed. Talk about options! Be sure and by your toddler or conversion kit at the time you purchase your crib. Many parent’s don’t, and are saddened and surprised when they come back years later to discover their crib has been discontinued or the finish is no longer available. 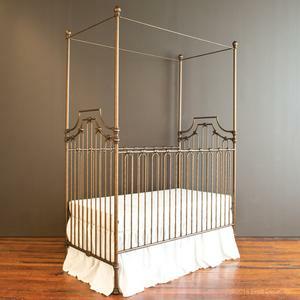 The premier iron baby bed is the perfect interpretation of an antique French design. 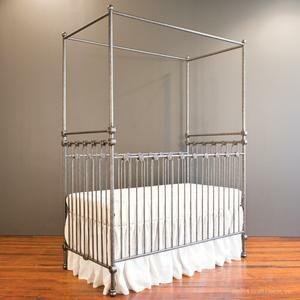 This iron crib has been in our line since 1995 and was chosen by Jennifer Lopez when she was designing the nursery for her twins. It is beautiful, timeless and will never go out of style. 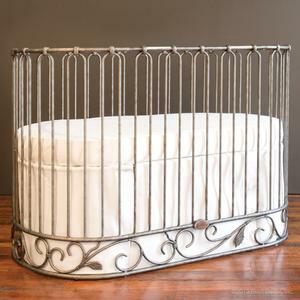 If metallic are your thing, you can’t do better than an iron baby crib. The silver and gold shimmers and shines throughout the piece. 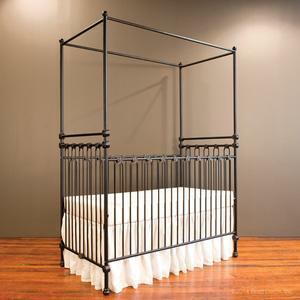 Bratt Décors iron baby cribs have a very unique finish, which combines layers of hand applied patinas that result in a depth and richness not found in other iron designs. For a simpler look, opt for a distressed white finish. Slight distressing makes normal wear and tear invisible, and will always look beautiful. 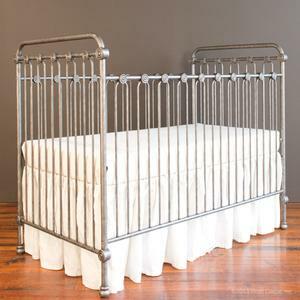 When storing your iron baby crib for future use, be sure to do so in an environment that is not excessively humid. Water can rust even the hardest of metal finishes. 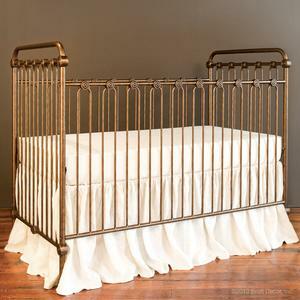 If properly taken care of your iron crib will last a lifetime.